Verona In Love! 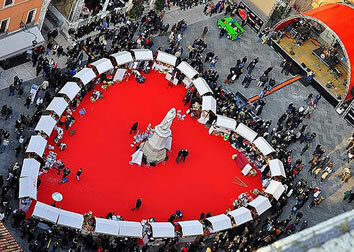 Valentine's day in the town of Romeo and Juliet is a special day: concerts, events, happenings, all dedicated to love. 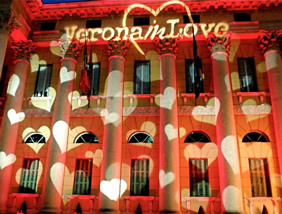 According to a well-established tradition, on the festival of St Valentine’s Day Verona offers many ideas to celebrate an unforgettable romantic weekend: Verona in Love 2020 is preparing to conquer the hearts of lovers with a mix of poetry, magic and entertainment... 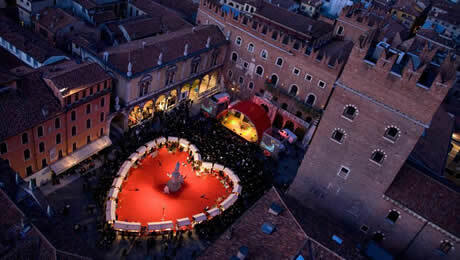 Spend a romantic weekend in the magical city of Romeo and Juliet to celebrate Valentine's Day in a very special way! • Arrival to Verona airport and reach your hotel by your own. • Buffet breakfast and be ready to explore Verona, setting of Shakespeare’s Romeo and Juliet. • At 10:00 live a fascinating Verona love, food and wine tour that combines art and food in an unusual experience! • This new Verona wine tour includes a guided tour of the old town, the famous monuments and lesser-known areas, with one or more pauses for wine tastings and typical products! • Wine tasting in Verona, paired with a food tour in Verona and great classics of Italian cuisine, will be a welcome break from walking, an opportunity to get close to the rich culinary tradition of our beautiful country and to fully appreciate the different sides of Verona. The charm of a Verona food tour and the pleasure of a guided walk: Verona will never have looked so spectacular! The beauty and importance of Verona, in particular the Arena and the myth of Romeo and Juliet, go far beyond the famous attractions which forms the essence of this city. • A walk through the small streets and squares of the old town offers much more. The presence of ancient Rome, the medieval lordships, the Venice Republic and the Hapsburg Empire is apparent in the architecture of the buildings, the details and atmosphere of some areas of the centre. The coexistence of different styles that have survived in harmony, are unique and spectacular, which can be best experienced with the explanations of an expert local guide. • After the tour and the light lunch, continue the visit of Verona by your own and mix the classic history with an LGBT perspective: gay and lesbians artists and historic celebrities with their vision of sexuality. 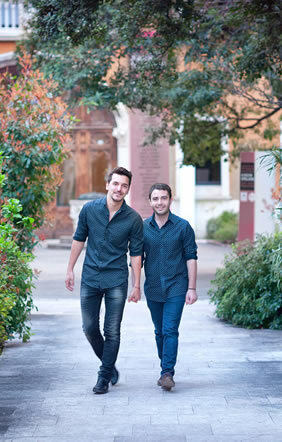 Rainbow Tips: Own the night in one of the several LGBT clubs in Verona like Milord or Romeo’s. • Afterwards transfer by your own from the hotel to the Airport. The Grand Hotel, Verona, was built in the Liberty style in the 1920’s at the request of a noble Austrian family, the Reichenbach. It was their elegant city residence and was subsequently turned in to a hotel without changing the architectural quality. In the hall, the public areas and the indoor garden, you can admire valuable furniture and decorations. Paintings and sculptures of famous artists such as Ciardi, Cascella, Minguzzi, Manzù, Purificato, Murer, Arnoldi and many others. Together with these valuable pieces of art, you can also admire the beautiful “Verona” red marble floor, dating back to the original period. At a 5-minute walk from Verona’s historic centre, the Grand Hotel is close to wherever you need to be, yet also quiet and peaceful. Enjoy the hotel’s small zen garden and terrace area. Relax in the sun here with a drink. Guests can also enjoy free refreshments such as tea, coffee and sweets in the hotel lobby.